Pilgrimage commences with prayers at the Memorial Wall at Glasnevin Cemetery in Dublin this morning and concludes at the Peace Park in Messines, Belgium. The Catholic and Church of Ireland Primates of All Ireland will today set off with a group of 30 young adults on a centenary pilgrimage to the sites at the Battle of the Somme. Archbishop Eamon Martin and Archbishop Richard Clarke’s pilgrimage will commence with prayers at the Memorial Wall at Glasnevin Cemetery in Dublin this morning and it concludes at Peace Park in Messines, Belgium. 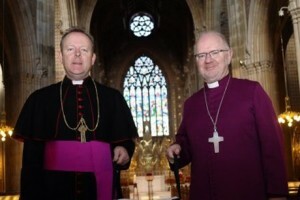 Archbishop Richard Clarke suggested that the pilgrimage would be “far more than a purely physical journey”. The young people participating in the pilgrimage include pilgrims from the Archdiocese and Diocese of Armagh; pilgrims from the Church of Ireland dioceses of Clogher, and Cork; and pilgrims from the Catholic diocese of Kildare & Leighlin. The most significant moments on the pilgrimage aside from the prayers at the Memorial Wall at Glasnevin Cemetery will be the visit to the Ulster Tower in Thiepval, France; the wreath laying ceremony at the Menin Gate, Ypres, Belgium on Thursday 23 June; and the visit to the Irish Peace Tower, Messines, Belgium, on Friday 24 June. The Battle of the Somme was fought by the British and French against the Germans. It took place between 1 July and 18 November 1916 on both sides of the upper reaches of the River Somme in France. It was the largest battle of World War I on the Western Front; more than one million men were wounded or killed, making it one of the bloodiest battles in human history. Among the dead were over 3,500 soldiers from Ireland, with many more wounded. This large loss of life was made even more horrendous by its occurrence within the short space of the first day of the Battle and two days in the following September. In particular, the 5,500 casualties of the 36th Ulster Division on 1 July were men drawn almost entirely from one community in the province of Ulster. Nearly 2,000 soldiers from cities, towns, villages and town lands of the North were killed in the first few hours of fighting, an event which seared itself into the folk memory of their community. In a continuation of the same battle, the 16th Irish Division had 4,330 casualties in September, of whom 1,200 were killed. These came mainly from the other three provinces. Added to these were the Irish soldiers who fought in other divisions as part of the regular army or in the newly raised battalions. The total number of Irish casualties cannot be calculated with certainty but they affected every part of the island.